Trees are pillars of living majesty that can take hundreds of years to grow; chainsaws are violent, hungry machines that bring them tumbling to the ground in minutes. If it seems like a crime to fell something so fantastic just for its wood, remember that trees usually die from the inside out and often become dangerous toward the end of their life. Sometimes fallen trees block roads or railroads and need to be chopped and cleared in a hurry: in emergencies and natural disasters, there's often no more welcome sound than the buzz of a chainsaw. If you think chainsaws are damaging and destructive, remember that they're very useful for routine forest management—for thinning and clearing trees to ensure the overall, long-term health of woodland habitats and the creatures who live in them. 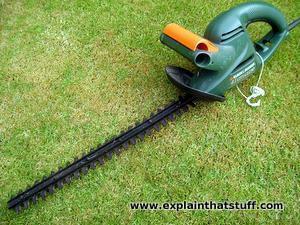 What exactly is a chainsaw and how does it work? Let's take a closer look! Photo: Chainsaws to the rescue! 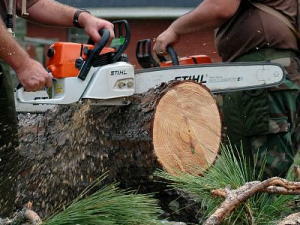 Two US Navy personnel help to clear up trees felled in Gulfport, Miss. in August 2005 by Hurricane Katrina. Photo by Ja'lon A. Rhinehart courtesy of US Navy. Photo: A chainsaw is a simple and amazingly effective idea: put your saw on a chain and let a small gasoline (petrol) engine do the hard work! Here are some of the main parts of a typical Stihl chainsaw. Photo cropped from a picture taken by Jon Hyde, courtesy of US Navy, with annotations by explainthatstuff.com. The clue is in the name! A chainsaw has two main parts: a saw blade built into a chain, wrapped around a long metal guide bar, and a small, one-cylinder gasoline (petrol) engine (sometimes an electric motor powered by a cord or battery pack). The chain is a bit like a bicycle chain, running around sprockets (gear wheels designed to turn a chain) only with about 30 or so sharp teeth (made from a hardened steel alloy) mounted around it at intervals. Inside the engine, as the piston moves in and out of the cylinder, it pushes a connecting rod that turns a crankshaft. 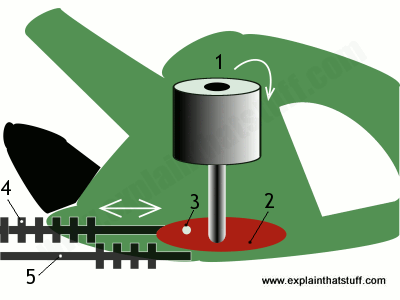 The crankshaft turns gears that are connected (through a centrifugal clutch, explained below) to one of the sprockets on which the chain is mounted—and the chain spins around. How a chainsaw turns gasoline into sawdust! The fuel you put in a chainsaw's gas tank contains, in chemical form, all the energy you'll consume cutting down and chopping up logs. To keep it nice and light, a typical chainsaw tank holds just 0.5 liters (1.1 US liquid pints) of gas (a car's gas tank holds maybe 45–55 liters or 12–15 US liquid gallons, which is roughly 100 times more). The fuel feeds through a carburetor to mix it with air. The air-fuel mixture passes into a cylinder, which works much like the ones in a car engine but with only a simple push-pull (two-stroke) action instead of the more complex (four-stroke) cycle used in a car. Inside the cylinder, the air-fuel mix is ignited by a spark (sparking) plug, burns, releases its energy, and pushes a piston back and forth. The piston in a chainsaw engine has a bore (diameter) of about 45mm (1.75 in) and a stroke (traveling distance) of about 33mm (1.3 inches)—so it's less than half the size of a typical car engine piston and moves only half as far. A connecting rod and crank convert the back and forth motion of the piston to rotary motion. A drive shaft takes power to the centrifugal clutch. A chainsaw engine runs all the time, but you don't want the chain spinning unless you're actually cutting wood: that's dangerous and it wastes energy. The clutch solves this problem. 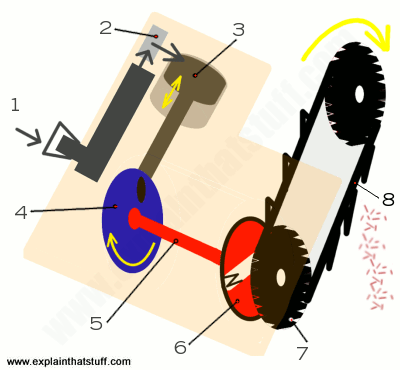 As explained in more detail below, the centrifugal clutch connects the engine and the chain when the engine speed is fast (when the operator pulls on the throttle) and stops the chain from spinning when the engine speed is low (when the chainsaw is just idling). Gears carry power from the clutch to the sprocket that holds the chain. The chain spins around the edge of a long-steel plate called the guide bar, spitting out wood dust as it goes! Let's talk a bit more about the clutch. A clutch is a device that makes and releases a mechanical connection between an engine and the machine it's driving: it's a kind of "switch" that allows an engine to run all the time (which is quicker and easier than switching it on and off) without always driving the machine it's connected to. In a chainsaw, the clutch means you can keep the engine running all the time and simply disengage the chain (so it stays safely motionless) when the saw isn't actually being used. Chainsaws use a centrifugal clutch, which automatically engages when the engine spins at high speed (when the saw is actually chopping wood) and disengages when it's running more slowly (idling, in other words). A centrifugal clutch is really simple and consists of just a few parts. There's an inner drive shaft (linked directly to the engine and spinning all the time) and an outer rim positioned around it (connected to the chain sprocket). In between them are mechanical arms, connected to the inner shaft, that fly outward at high speed (with centrifugal force—or with the lack of centripetal force, if you prefer) locking the inner and outer parts of the clutch together. Centrifugal clutches are also used in high-spec yo-yos. 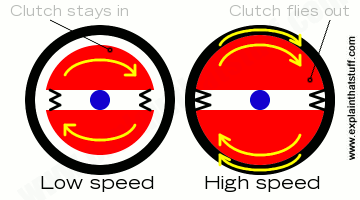 Photo: How a centrifugal clutch works: Left: At low speed, the inner parts of the clutch (red) are held tightly together by springs (black zigzags). There's a gap between the inner and outer parts of the clutch so the outer part (black) does not rotate even though the inner part spins around quickly inside it, powered by the central drive shaft (blue). Right: At higher speed, the springs can't stop the inner parts of the clutch flying out and locking with the outer rim, causing it to rotate as well. You can think of centrifugal force making the inner parts of the clutch fly out at speed or, if you prefer, you can see that the tension in the spring can't provide enough centripetal force to keep everything together at higher speeds. The main advantage of using a chainsaw—speed—is fairly obvious. It would be hard to spend an entire day chopping your way through a forest with a handsaw, but you could certainly do that with a chainsaw. 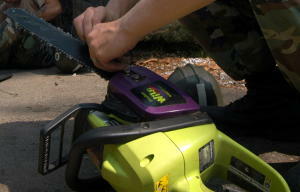 A little crude math shows why a chainsaw is maybe 5–10 times quicker than an ordinary hand saw. Think how many planks of wood you could make from a single, trimmed tree trunk: maybe ten or fifteen? Now think how laborious it is to saw through a single plank with a handsaw; cutting through an entire tree is going to take you at least 10 times as long, assuming you don't run out of energy or melt your saw blade first. Photo: Forestry management: A chainsaw can cut through a tree in about a tenth the time you'd need with a handsaw. Unlike a handsaw, it's just as easy to use sideways on (as shown here). Using a handsaw at this angle is really tricky! Photo courtesy of US Fish & Wildlife Service. Let's try a more sophisticated estimate. Suppose you have a tree that is 30cm (roughly 1ft) in diameter and a chainsaw that makes a cut of 0.5mm (0.02in) into the wood with each pass of the chain. That means the chain needs to pass through the wood 600 times (30cm = 300mm and it takes two chain passes to remove each mm). If you're using a powerful chainsaw with a rotational speed of about 2800rpm (call it 3000rpm to make the math easy), the chain will (theoretically) make 600 passes in just 20 seconds. In practice, it'll take somewhat longer. Let's say a minute. How long would it take with a handsaw? Suppose your saw has teeth the same size as the chainsaw's and suppose it's roughly the same length as the chainsaw (and therefore half as long as the chain). You still need to make those 600 passes through the wood. Maybe you're superhuman: suppose you can make one complete pass of the saw each second and keep up that pace constantly. Then it's still going to take, as a minimum, 600 seconds—or 10 minutes. In practice, it's going to take quite a bit longer as you get tired, as the saw slips out of its groove from time to time, and so on. These are only guesstimate, back-of-envelope calculations—but you get the idea: using a chainsaw is certainly several times faster (and probably 5–10 times faster) than using a good handsaw. Photo: Chainsaw maintenance: Although absolutely vital for safety and performance, routine checks and repairs can be time-consuming chores that eat into the time you save with a mechanized saw. Photo of a Poulan Wild Thing chainsaw by Dennis J. Herring courtesy of US Navy. 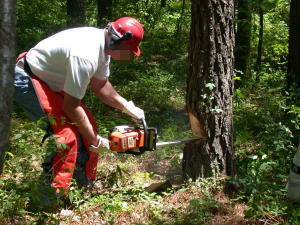 The two biggest drawbacks of chainsaws are safety and maintenance. Although chainsaws can be used by any fairly strong adult (after suitable training), they are nevertheless inherently dangerous. (I have the manual for a Stihl MS270 chainsaw open beside me as I write this and it's interesting to note that about 16 of the 64 pages—fully a quarter of the text—is devoted to warnings and safety precautions.) The biggest risk comes from a problem called kickback, where the chain catches on something but the engine keeps turning, so the whole saw flies up and backward toward your head (think action and reaction—Newton's third law of motion), potentially causing fatal injuries. Chainsaw helmets with visors offer some protection; so too do chainsaw uniforms (made from synthetic fibers such as nylon, which snag up the chainsaw teeth and bring the machine quickly to a halt). The other big problem with chainsaws is the amount of maintenance they need. A handsaw is delightfully maintenance free: the sawdust you produce simply falls out of the groove you're making. In a chainsaw, the super-fine dust can get caught up in the mechanism and mix with the chain's lubricating oil to make a gungy mess that has to be cleaned out regularly. Again, looking at the manual for the Stihl MS270, it's interesting to see there's a full-page chart spelling out a couple of dozen different checks and maintenance jobs you have to do before starting work each day, or on a weekly, monthly, or annual basis thereafter. So while it's true to saw that chainsaws save you time in the actual chopping of wood, some of that time is, unfortunately, lost in maintenance! Artwork: The earliest chainsaw, invented by Samuel Bens in 1905, illustrated in his original patent application, which I've colored simply and tidied slightly to make it easier to follow. Here you can see the saw operating in two different configurations. In the top picture, we're looking from the side and the saw is pivoted so it slices horizontally. In the middle picture, we can see the same configuration but we're now looking down from above. In the bottom picture, the saw has been rigged up with a pulley so it slices a fallen log vertically. Artwork courtesy of US Patent and Trademark Office. The earliest patent for an "endless chain saw" (US patent 780,476) was granted to Samuel J. Bens of San Francisco on January 17, 1905, and filed roughly 18 months earlier in July 1903. Here's one of the diagrams from that patent, showing (from the side and from above) a huge, static sawing machine slicing through a tree trunk. Bens was mainly concerned with how the saw worked and didn't specify the power source, except to note that it was "furnished with driving power, such as a steam-engine, gas-engine, or motor of any kind." About 16 years later, in 1921, he filed another patent (US patent number 1,617,565) for a portable chain saw that "aims to provide a simple, compact, durable, and efficient machine capable of being easily handled by a couple of operators to rapidly and expeditiously cut logs or trees irrespective of the position, and one which can be readily conveyed from place to place." Electric motor spins inside the handle section. Motor turns a disc at the bottom. Crank or cam on the disc engages the top blade and makes it move. Moving blade shifts back and forth (reciprocates) as the motor spins around (rotates). Stationary blade helps to cut branches as the moving blade shifts past it. It's much the same mechanism as you'll find in an electric carving knife, though bigger and and more powerful. Symphony of Chain Saws Cuts Clean Through Central Park's Calm by Hunter Atkins. The New York Times, June 20, 2015. Chainsaw-wielding lumberjacks compete in a New York City contest sponsored by Stihl. How to Sculpt With a Chain Saw by Malia Wollan. The New York Times, August 28, 2015. A very short introduction to the basics of chainsaw sculpture. Hand Powered Chainsaw: Chop Trees, Keep Fit by Charlie Sorrel. Wired, July 20, 2007. How to cut high branches with a chain on a rope. Chainsaw Manual for Homeowners by Brian Ruth. Fox Chapel, 2018. An illustrated guide to twelve common chainsaw tasks, including a short buyer's guide. Norwegian Wood by Lars Mytting. Hachette, 2015. A practical guide to chopping and stacking wood the Scandinavian way. Homeowner's Complete Guide to the Chainsaw by Brian J. Ruth and Jen W.Ruth. Fox Chapel, 2010. A step-by-step guide to basic, everyday woodcutting for ordinary homeowners who need to chop a lot of wood. Chainsaw Operator's Manual: The Safe Use of Chainsaws by Bernard R. Kessel. Landlinks Press, 2005. An alternative guide to basic chainsawing designed to comply with the National Competency Standards. US Patent 780,476: Endless chain-saw by Samuel J. Bens. The very first chainsaw, although a large static machine and not a portable handheld saw. 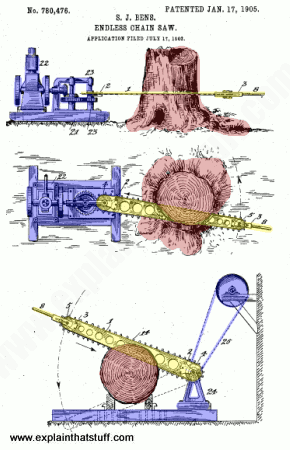 US Patent 1,617,565: Tree sawing apparatus by Samuel J. Bens, Chain Saw Corporation. A slightly later, portable, gasoline-powered chainsaw that Bens invented in 1921, with the patent granted in 1927. Wayne's Chainsaw Museum: A short video tour of Wayne Sutton's chainsaw museum in the United States, will hundreds of saws dating from about the 1930s. Flickr: Chainsaw carving: Search Flickr for photos of surprisingly detailed wood carvings made with chainsaws.